HOUSTON (KTRK) -- Summer break today means packing boxes and separating food. Student and volunteer Yazmeen Abdullah said, "It's been really fun so far being at the food bank, really interesting." The students are part of the CASE for Kids (The Center for Afterschool, Summer and Enrichment for Kids) program, a Division of the Harris County Education Department. But there is a lesson behind today's assignment. Abdullah said, "I think the food they are throwing in the trash could go to people who don't have food or people around the world who can't afford food." Parents and volunteers noticed some kids throwing their food away during summer enrichment programs. Parent Maria Vega said, "I think with the kids being here today they are learning about the needs of many people and the importance of not wasting food because many people do need it." This is an effort to show them the value of food and that hunger is a real problem for many in Houston every day. 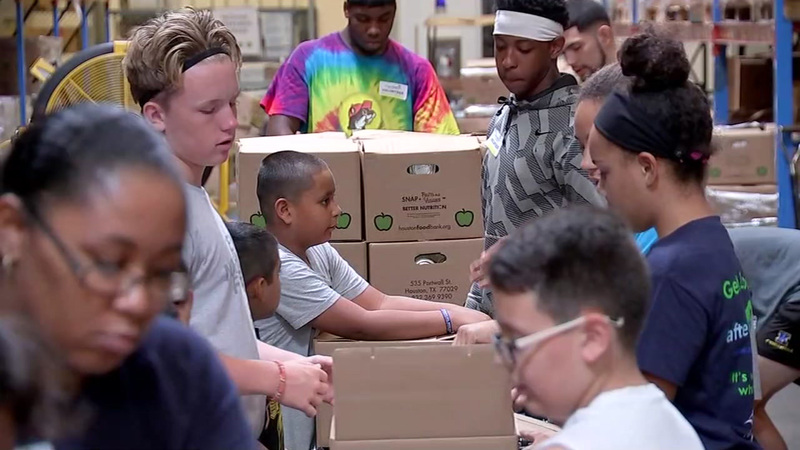 "When they packed they learned each box had to have a balanced meal, and so they learned about a recipe for the box so they are packing healthy things for senior citizens," said Lisa Caruthers, Director of CASE for Kids. After a morning of volunteering, Abdullah admitted she had definitely worked up an appetite. Schools participating included Frances Elementary, Aldine ISD; Spring Forest Middle School, Spring Branch ISD; Sharpstown International, Houston ISD; and South Houston Elementary, Pasadena ISD. About 100 students and 35 parents volunteered. CASE for Kids provides resources, training and funding for students in grades pre-K through 12 in afterschool programs in schools, child care facilities and community centers throughout Harris County. Students are enrolled in CASE for Kids programs through Texas Afterschool Centers on Education (ACE) 21st Century, administered by the Texas Education Agency. About the Center for Afterschool, Summer and Enrichment (CASE) for Kids: CASE for Kids, formerly the Cooperative for After-School Enrichment, was launched by Harris County Department of Education in 1999. CASE for Kids is an after-school intermediary which leverages community resources and strengthens the capacity of the out-of-school time field. Services benefit approximately 12,000 kids in greater Harris County. CASE for Kids programs happen before and after school, on weekends and during the summer. Go to www.afterschoolzone.org for information.